In the second episode of Justified, Deputy U.S. Marshal Raylan Givens is assigned the unenviable task of escorting Dewey Crowe (the hilarious Damon Herriman) from jail to prison. Perhaps to treat himself for taking on such a Herculean test of his patience, Raylan allows himself some gloating at the expense of the recently ventilated Boyd Crowder (Walton Goggins) and, following Dewey’s successful delivery to the Kentucky State Prison, stops off for some “road food”… and that’s when the action starts. This jacket only appears during the first season when Ane Crabtree was the show’s costume designer and, even then, predominantly at the outset of the second episode, “Riverbrook” (Episode 1.02). After Patia Prouty took over as the costume designer for the second season onward, it was never seen again. Raylan’s smirk isn’t long for his face after facing the business end of an escaped convict’s shotgun. 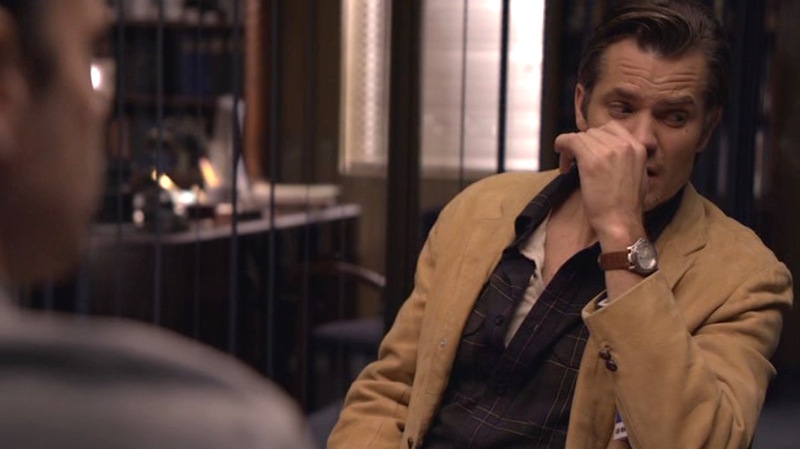 The unstructured jacket has three dark brown buttons down the front, although the short fishmouth-style notch lapels often flap back over the buttons since Raylan always wears it open. Two smaller buttons decorate each cuff. A reasonable look for anyone’s face upon the realization that some one-on-one time with Dewey Crowe is imminent. The jacket is fully lined in what appears to be taupe satin-finished rayon. There is a single vent in the back. The three outer pockets are all patch pockets with rounded bottoms. The large hip pockets close with a rectangular flap. In “Riverbrook” (episode 1.02), Raylan wears an indigo blue chambray shirt with white plastic buttons up the edge-stitched front placket to the collar, worn open with the top two buttons undone to reveal the white ribbed cotton sleeveless undershirt beneath it. The two patch pockets on the chest have mitred bottom corners and close at the top through a white plastic button, and the left pocket has a stitched slot for a pen. Each cuff also closes with a single white plastic button. 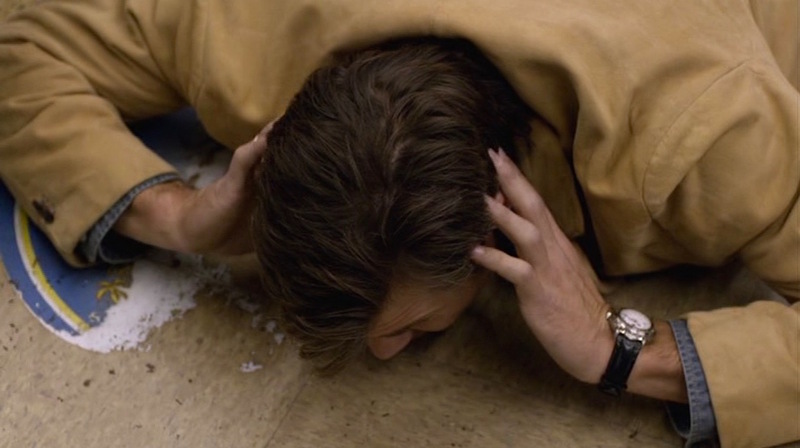 The shirt may be a darker version of the medium-sized Merona “denim shirt” included in a 2014 ScreenBid auction lot with another of Raylan’s first season outfits. 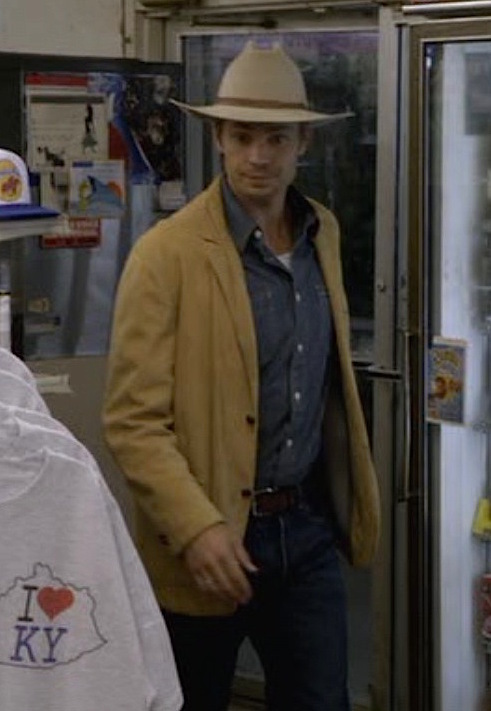 If so, the choice to place Raylan in a budget shirt from Target’s house brand would be very on brand for the no-nonsense lawman who always puts function before fashion. As of May 2017, Target currently offers a very similar woven cotton shirt, “Crafted by Lee”, albeit with metal buttons and pocket flaps. 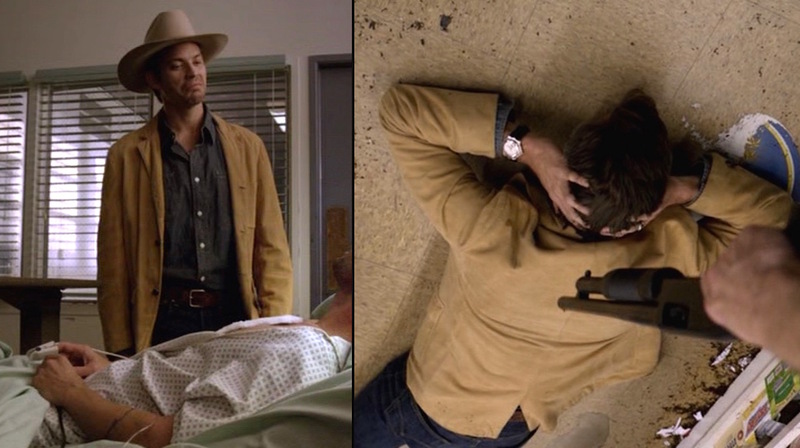 When the jacket reappears in “The Collection” (episode 1.06) and “Veterans” (episode 1.11) later in the season, Raylan is now wearing it with a brown plaid flannel shirt half-buttoned over a beige cotton long-sleeve henley. The plaid pattern consists of a large-scaled grid of thin beige shadow stripes, windowpaning over the shirt in sets of two spaced out a half-inch apart. The shirt itself has a front placket, flapped chest pockets, and buttoned cuffs. 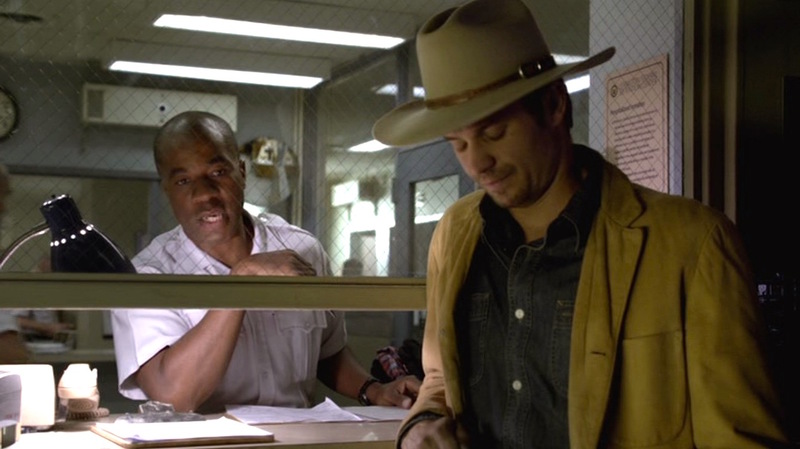 Raylan confronts Boyd in the U.S. Marshals’ office in “Veterans” (episode 1.11). Note the brown band on his wristwatch, swapped out from the black strap in “Riverbrook” (episode 1.02). 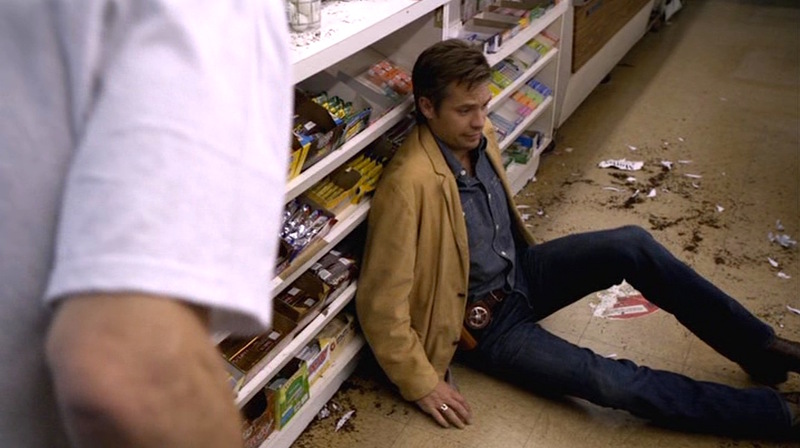 Raylan also wears a pair of classic Levi’s 501 jeans in dark blue stonewashed denim. Advertised by Levi’s as “The Original Button Fly Jean”, the straight-leg 501 jeans would be Raylan’s preferred bottom half for the show’s duration. In addition to the Levi’s site, you can pick up a pair of classic 501s from online retailers like Amazon. Raylan’s light brown tooled leather belt is also likely from Levi’s, as his later belts would be, with brown embossed designs and a steel single-prong buckle. He clips his Deputy U.S. Marshal badge to the front of his belt, just to the right of the buckle. Fixed to the right of his belt, Raylan wears the light brown full-grain leather Bianchi Model 59 Special Agent® thumb break paddle holster, model #19128, for a smooth right-handed draw of his full-size Glock 17. 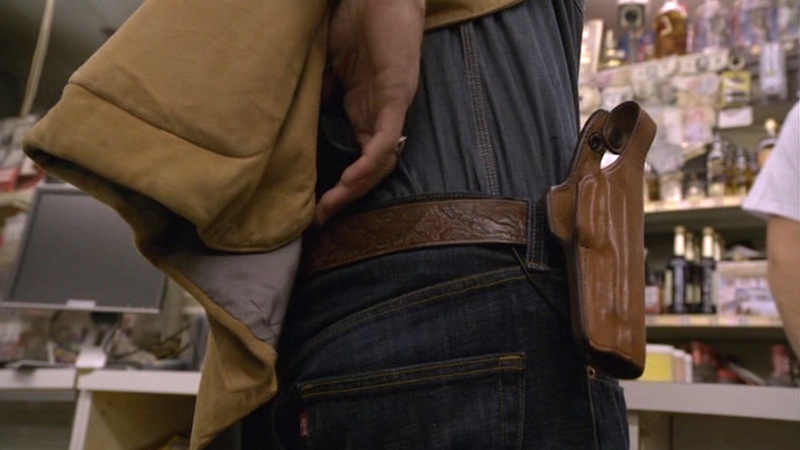 Raylan is even forced to surrender his backup weapon at the hands of the fugitive criminals in “Riverbook” (episode 1.02), giving viewers a good look at his belt and holster as well as the distinctive red tag of his Levi’s jeans. The embossed tooling of his brown leather belt coordinates with his slightly darker but equally decorative custom Lucchese cowboy boots in “cigar” brown ostrich leg. 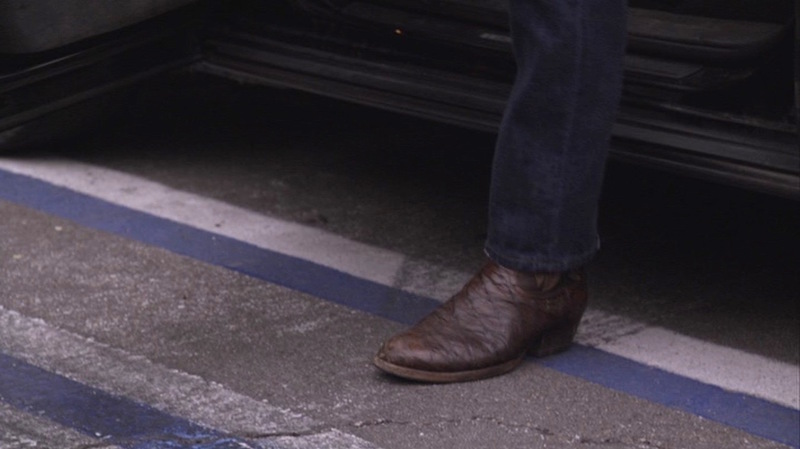 Raylan steps out in “Veterans” (episode 1.11). After switching between a Rolex and a TAG Heuer in the pilot episode, “Riverbrook” (episode 1.02) establishes the latter as Raylan’s everyday timepiece. He wears a brushed steel Series 6000 Chronometer with a white dial, switching between a black debossed leather strap (as seen in “Riverbrook”) and a brown alligator strap (as seen with his browner outfit in “The Collection” and “Veterans”). 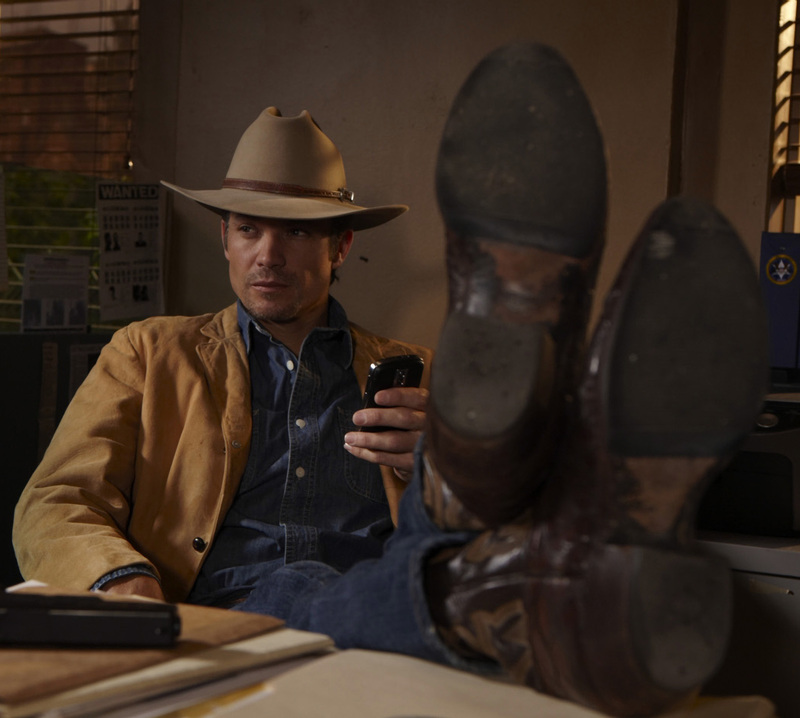 Career criminal Douglas Cooper (Chris Ellis) immediately finds himself on Raylan’s bad side by purloining the lawman’s treasured cowboy hat, a sahara tan cattleman’s hat in 200XXX beaver, custom made by Baron Hats of Hollywood for their long-time customer and fan Timothy Olyphant to wear on the show. In addition to the 4.25″ crown and 3.25″ “Prairie Wave” brim, the hat – marketed as The RG by Baron Hats – has a brown hand-tooled 3/8″-wide leather band with a steel Ranger-style buckle on the left. “Honestly? 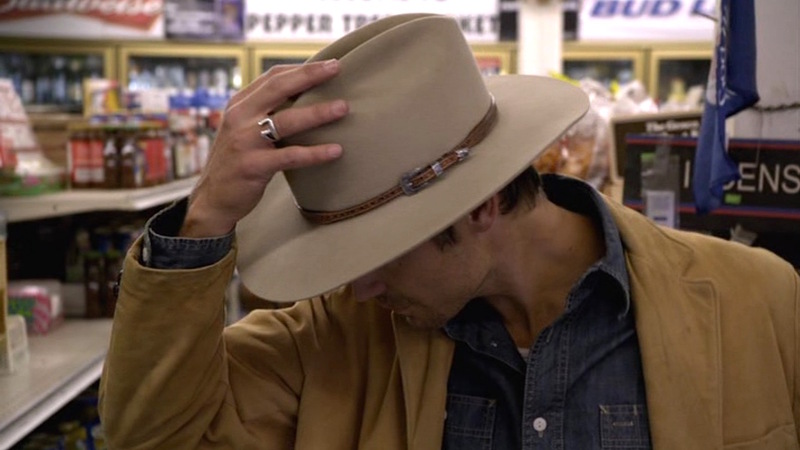 I tried it on one time, and it fit,” is Raylan’s explanation for his iconic hat when questioned later by Rachel in “Riverbrook” (episode 1.02). Old school cowboy cop that he is, Raylan also wears a sterling silver horseshoe ring on the third finger of his right hand, channeling the preferred transportation of spiritual forebears like Wyatt Earp and Bat Masterson. 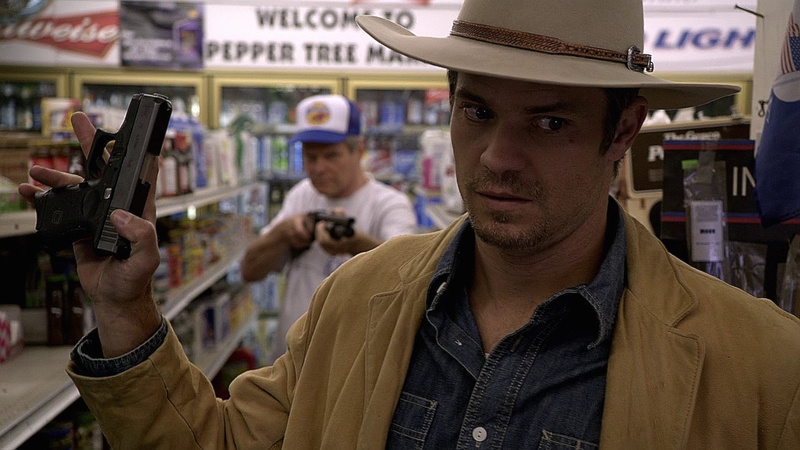 Before a layered denim trucker jacket and jeans was firmly established as his standard off-duty look, Raylan Given’s preferred casual attire consisted of this unstructured suede jacket and jeans that, when paired with a cowboy hat and boots, is certainly reminiscent of the traditional Western lawman. I can’t testify personally to its quality, but one of the closest examples I’ve been able to find online is this “Sublime Suede Pickstitch Blazer” (link) from Territory Ahead for $375, although it lacks the patch pockets of Raylan’s jacket. At the sound of a pump shotgun being chambered behind him, Raylan Givens’ hand flies to the Glock 17 worn in a Bianchi holster on the right side of his belt. “There’s no way in hell you’re gonna be able to draw and fire before your head comes off,” warns the shotgun-toting Cooper behind him. 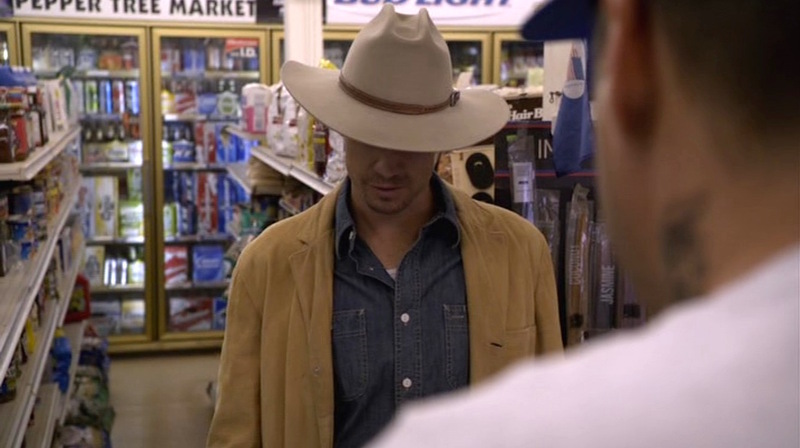 “I could get him,” assures Raylan, indicating the possible fate of the dimwitted Price in front of him. Raylan doesn’t make much of an effort to conceal the Glock on his belt, but a more experienced crook like Cooper knows that a guy like Raylan is almost certainly carrying a backup piece. “And your backup,” instructs Cooper, and the not-oft-foiled Raylan is forced to reach behind his back to slowly produce the subcompact Glock 26 pistol that he occasionally is seen carrying as a secondary sidearm. Raylan is forced to hand over his backup Glock 26. The Glock 26 was developed in 1995, introduced as a concealed carry alternative aimed for the civilian market. Chambered for 9x19mm Parabellum, the Glock 26 feeds from a standard magazine of 10 rounds, but – like most of Glock’s subcompact pistols – is designed to feed magazines interchangeable between models of the same caliber; thus, the Glock 26 can also feed from the full-size Glock 17’s standard 17-round magazine and the compact Glock 19’s standard 15-round magazine. The relationship of service and subcompact Glocks can also be found in the film U.S. Marshals (1998), when Deputy U.S. Marshal Samuel Gerard (Tommy Lee Jones) is forced to hand over both his .40-caliber full-size Glock 22 and its subcompact .40-caliber variant, the Glock 27, as he boards a plane. 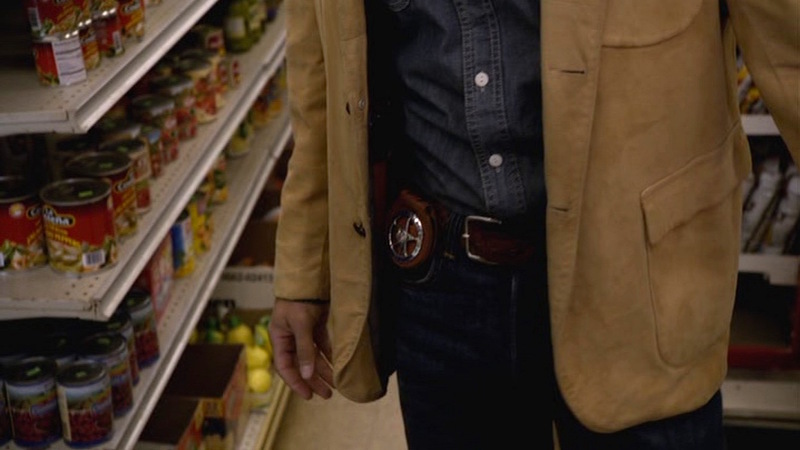 In addition to being Raylan’s backup weapon for at least the first four seasons of the show, the Glock 26 is also prominently featured on Justified as the standard sidearm of Deputy U.S. Marshal Rachel Brooks (Erica Tazel). Buy the entire series . The screenshots featured here are from the first season. What you’ll have to do now is ride the rap, as they say. That’s all anybody has to do. There was an early shot the costumer posted with the liner visible. The hat is the Stetson Carson with a band they added on set. It was later rebranded the Marshal because of the series and a leather band similar to the one worn in the show was added. But the hat is definitely a Stetson. Pretty good info but you got a few details wrong. First the boots are Lucchese Anteater boots not ostrich leg as the ostrich leg boots did not come until later (next season I believe). Second, the belt in this episode was not a Levis belt, but instead it was made by Chambers.